The trouble with research is that you never know when you are finished. People, places and things that you are interested in keep coming back to haunt you. This photograph of the Gertrude Stein statue in Bryant Park, New York was taken on 7 February. Either someone knows how much she liked her little cakes or they are a gift to celebrate her birthday (on 3 February). For more information about the statue see the Bryant Park Blog here. Bryant Park itself has an interesting history which you can read about here. I came across Gertrude (well to be truthful I was looking for her) en route to the New York City Library to see the Lunch Hour NYC exhibition (which I have mentioned before and you can read about here) but not before I also encountered Carl Van Vechten's name carved into the sandstone in the library foyer. So can Alice be far behind? 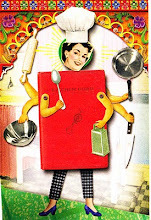 Well since I last wrote about her cookbook I have encountered more information about her too. Deanna Sidney at Lost Past Remembered here introduced me to Naomi Barry's essay in Remembrance of Things Paris: Sixty Years of Writing from Gourmet. Then reading Laura Shapiro's Something from the Oven. Reinventing Dinner in 1950s America I discovered a whole chapter on Poppy Cannon who collaborated with Alice on Aromas and Flavours of Past and Present. (which I wrote about here). Poppy herself was a wonderful character and I thoroughly recommend Shapiro's thoughtful account of her life and her legacy.
' to enjoy this book you must find your pleasure in the company of Alice B. Toklas - in a woman who knew exactly who she was. It is this that gives the book its measure of wild charm and also draws its limits, for she was a person of intense domesticity who, having established her realm, felt totally independent within it. John Thorne, Simple Cooking, Viking, New York, 1986. Laura Shapiro, Something from the Oven. Reinventing Dinner in 1950s America, Penguin Books, New York, 2004.